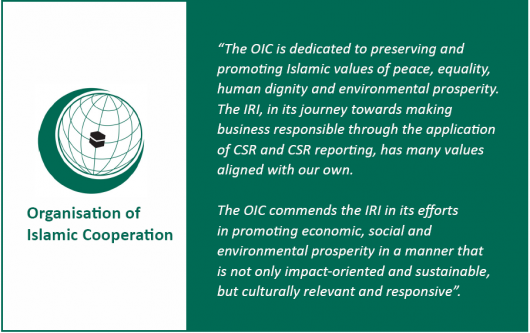 The Organization of Islamic Cooperation (OIC) has commended the Islamic Reporting Initiative (IRI) framework for CSR reporting, for its capacity to make businesses in the Islamic world more sustainable and prosperous. OIC: “The OIC commends the IRI in its efforts in promoting economic, social and environmental prosperity in a manner that is not only impact-oriented and sustainable, but culturally relevant and responsive”. Following a meeting in November with the OIC’s Permanent Observer Mission to the EU, the IRI received the commendation for its efforts towards making business in the Islamic world prosper, while strengthening society and the environment. OIC: “The OIC is dedicated to preserving and promoting Islamic values of peace, equality, human dignity, and environmental prosperity. The IRI, in its journey towards making business responsible through the application of CSR and CSR reporting, has many values aligned with our own”. Established in 1969, the OIC is the second largest inter-governmental organization after the United Nations. The organization is the collective voice of the Muslim world, safeguarding and protecting the interests of the Muslim world in the spirit of promoting international peace and harmony among various people of the world. The IRI is a not-for-profit organization headquartered in the UAE, creating the first mainstream reporting framework for CSR based on Islamic principles and values. Recently announcing the appointment of Jordan’s Minister of Environment to its Advisory Board, the IRI built membership in more than 30 countries in its first 6 months.